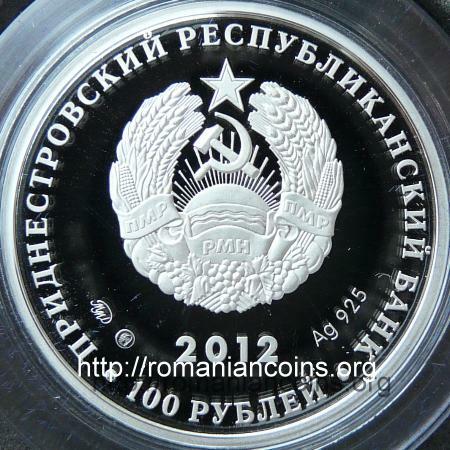 The coin belongs to the Church of Transnistria series. In 2001 pieces were struck for 9 churches, both in silver and gold. 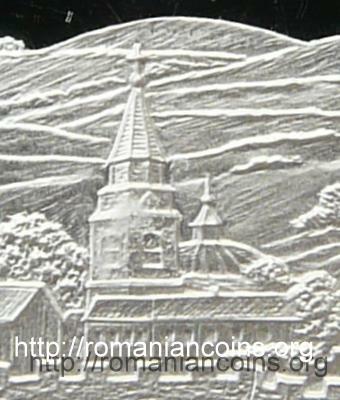 On the site silver coins are presented Raşcov, Zăzuleni, Stroieşti, Vadul Turcului and Vărăncău on one page, and those with churches from Chiţcani (Noul Neamţ), Tighina, Valea Adîncă and Tiraspol on another page. Two coins (silver and gold) were struck in 2006 for the Cathedral of Archangel Michael of Rîbniţa. Saint Andrew church from Tiraspol was erected on a place that belonged to the Tiraspol Fortress, in the central square of the fortifications. 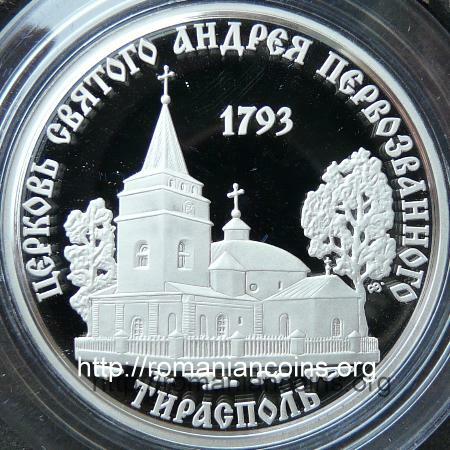 Moreover, on the Transnistrian coin with Tiraspol Fortress the church is also represented. The building was of white stone, with belfry and with a large vault. The church seems to have been demolished around 1930. Nowadays on the spot where the church was a school is placed . Several years ago a new church dedicated to Saint Andrew was erected at Tiraspol. This church belongs to the Operational Group of the Russian Armies in Transnistria, being located inside the barracks. 1. ***, Tiraspol - City on Nistru. The Nice Sound of the Bells. 3rd part. (in Russian). Internet site, retrieved in September 2012.